A well-stored bottled of the 1990 Bollinger R.D. was at its apogee on New Year’s Eve, although I suppose a British taster might have waited even longer. 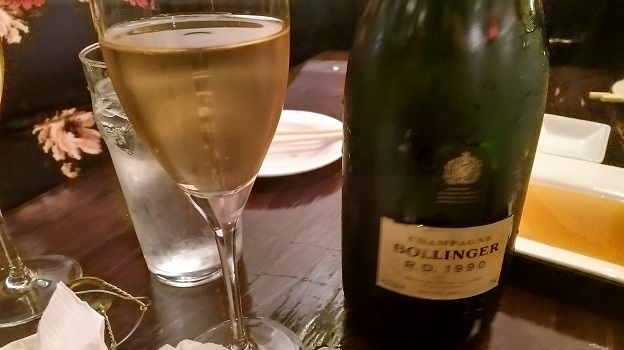 Bollinger is known for its very full-bodied, dry style—this is dinner-table Champagne—so it came as no surprise that the R.D. bottling from the very rich, ripe 1990 growing season was remarkably mouthfilling. The surprise was how much energy and power this full gold-colored wine still had, a quarter-century after the harvest. The cork emerged with a discreet pffft, and the R.D. showed a slow but very fine stream of bubbles in the glass. Its fully developed nose and palate displayed a strong uni aroma (and that was before our uni course arrived! ), complicated by deeply pitched notes of hazelnut, toffee, roasted nuts, truffle and baked bread, plus a faintly oxidative whiff of Calvados. The shocker was the back half of the wine: incredibly tactile and layered, with explosive vinosity and a saline, mounting, palate-staining finish. 94/Drinking window: 2016-2022.